Recent release “Cali Girl, How Did You Make it in the Treacherous Streets of Detroit?” from Page Publishing author Tianna Jones is a heartrending autobiography that depicts the author’s struggles throughout her life. Tianna Jones, a hardworking woman and a prolific writer who aims to inspire others with her wisdom about life, has completed her new book “Cali Girl, How Did You Make it in the Treacherous Streets of Detroit?”: a riveting true-to-life narrative detailing the author’s spar with life in the menacing streets of urban milieu. Published by New York City-based Page Publishing, Tianna Jones’s powerful tale portrays a woman’s resolve to surpass whatever trials that come in her way. “Cali Girl” is the ultimate downpour of the author’s evoking encounters with life’s difficulties, hoping to convey lessons of healing, understanding, and acceptance. 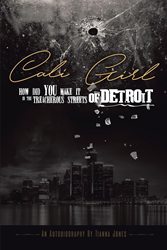 Readers who wish to experience this compelling work can purchase “Cali Girl, How Did You Make it in the Treacherous Streets of Detroit? at bookstores everywhere, or online at the Apple iTunes store, Amazon, Google Play, or Barnes and Noble.